with former Fire Chief O.M. West on February 17, 1913, the thirty-first anniversary of the disastrous fire. According to Chief West, the fire department was not well organized then. It had no modern fire apparatus with which to fight a fire of any magnitude. There were no permanent firemen. Citizens and call firemen alike heeded the call of fire. The only permanent men employed were the drivers of the three steam engines then in use. The drivers were often involved in other lines of work for the city. At the time of the fire, one of Haverhill’s steam fire engines was at the Amoskeag Fire Engine Works in Manchester, New Hampshire being overhauled. An old steamer of little worth became a temporary replacement. 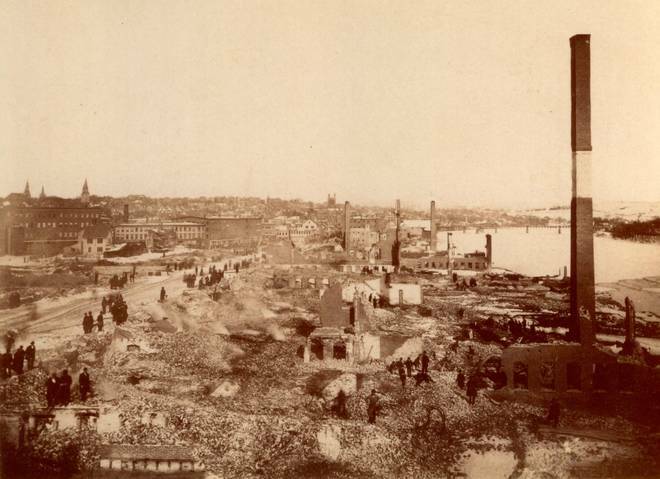 Days before the fire, Chief West inspected the factories that were later destroyed by the fire, including the one in which the fire is believed to have started. The chief had brought to the attention of building owners and shoe manufacturers alike a hazardous condition where wooden doors swung back against heated stoves. He ordered that the wooden doors be covered with tin. Instead of correcting the hazardous condition, the owners instead elected to increase the insurance on their property. A few days before the fire, Chief West appeared before the City Council to request additional fire apparatus and that the job of steam engine driver be made full time so the driver could remain at the firehouse. Since the total fire loss the year before had been only sixteen hundred dollars, council members were not receptive to his request. In those days there was no fire alarm system that would indicate a fire or its location. Instead, the old village method of alarm was often used. Citizens yelling "fire" and the ringing of church bells or a local whistle was common. The home of Chief West was at 126 Water Street, opposite the Water Street fire station that housed the "Essex" steam engine. The fire was discovered at 11:45 Friday night, February 17, 1882, one of the coldest nights of the winter. The thermometer registered six degrees below zero and there was a gale blowing. Chief West was awakened from a sound sleep by his mother-in-law, Mrs. Harriet Treab. (See Note:). As Chief West hurried from his home he heard no alarm indicating a fire; he did however smell smoke from the steamer. At Elm Corner he met a man who informed him that there had been a fire earlier, in a pharmacy, on Mt. Washington, but it had been extinguished. It wasn't until he proceeded to Eaton’s Corner and looked along Washington Street that Chief West saw the blaze. Realizing that it was in a wooden block and that some buildings contained inflammable material, he immediately upon arrival at the scene gave an order for addi­tional help and had telegrams sent to fire department officials in nearby communities. Chief West highly commended the Lawrence firefighters for the heroic work they did in the intense cold, stating that they undoubtedly prevented the fire from spreading to the east side of Essex Street. At that time the water system had a pressure of only fifteen or twenty pounds and much of the hose in use that night froze up. Due to these conditions, one firefighter put water on the burning coping of one building by playing a hose onto the blaze while his fellow firefighters held him by the legs from the roof of the building involved. At 5:00 am Saturday morning Chief West saw the chimney of the Tilton building on Wingate street begin to topple and shouted a warning to firefighters and spectators. His warning was too late, however, for fire­fighters Joseph St. Germain and George Whittier. The next day Joseph St. Germain was buried with great honors. Thousands of citizens joined in a demonstration of grief over his tragic and untimely death. Whit­tier, though seriously injured, recovered. Note: Mrs. Harriet Treab was the wife of George C. Treab, Haverhill’s sixth fire chief who served in 1867. The Treab's daughter, Mary Amanda, married Mr. West on October 18, 1862. Note: During the mid-1800's shoes were being manufactured in small Haverhill factories. In spite of the conflagration that nearly completely destroyed this small cottage shoe industry in 1882, by the 1890's, Haverhill's shoe production both quantity and quality had earned it the nickname the "Queen Slipper City" of the world. This poem, composed by Haverhill resident William T. Dwyer around 1885, puts Haverhill's 1882, confla­gration into perspective through rhyme. When Washington street was bound in flames of fire that o'er it rolled. When the shrill sound of the fire alarm, our citizens did hear. That the business portion of the town, was burning to the ground. Our city from destruction, and the grasp of Satan’s wave. Till neath its hand, fine structures in a heap of ruins lay. And those buildings fell beneath it, like the grass before the scythe. And it sent a feeling to the hearts of both the rich and poor. For the poor man from employment, was thrown upon the world, And the rich man with his thousands, into poverty it hurled. A thriving business center, as once it used to be. Bear this blow with a smile of hope, for soon it will decay. Here is to old Haverhill, may its name never die.